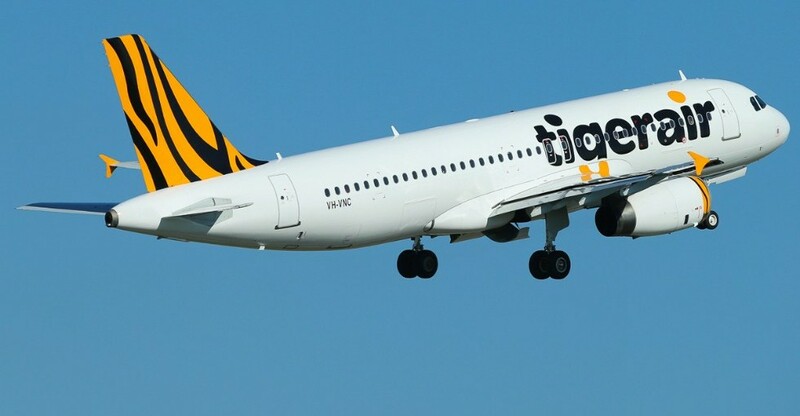 TigerAir is having a Saturday Flight Fever Sale! Lots of domestic fares on sale – check out the huge list below. Be quick – Sale ends at 4pm! to Melbourne Flights for $19 using Mastercard Debit Card. $27 using CC. to Sydney Flights for $55 using Mastercard Debit Card. $63 using CC. to Brisbane Flights for $69 using Mastercard Debit Card. $77 using CC. to Adelaide Flights for $19 using Mastercard Debit Card. $27 using CC. to Coffs Harbour Flights for $29 using Mastercard Debit Card. $37 using CC. to Hobart Flights for $39 using Mastercard Debit Card. $47 using CC. to Sydney Flights for $49 using Mastercard Debit Card. $57 using CC. to Gold Coast Flights for $55 using Mastercard Debit Card. $63 using CC. to Brisbane Flights for $59 using Mastercard Debit Card. $67 using CC. to Perth Flights for $119 using Mastercard Debit Card. $127 using CC. to Cairns Flights for $29 using Mastercard Debit Card. $37 using CC. to Gold Coast Flights for $35 using Mastercard Debit Card. $43 using CC. to Coffs Harbour Flights for $45 using Mastercard Debit Card. $53 using CC. to Brisbane Flights for $49 using Mastercard Debit Card. $57 using CC. to Melbourne Flights for $49 using Mastercard Debit Card. $57 using CC. to Adelaide Flights for $55 using Mastercard Debit Card. $63 using CC. to Perth Flights for $109 using Mastercard Debit Card. $117 using CC. to Melbourne Flights for $29 using Mastercard Debit Card. $37 using CC. to Sydney Flights for $45 using Mastercard Debit Card. $53 using CC. to Sydney Flights for $29 using Mastercard Debit Card. $37 using CC. to Brisbane Flights for $65 using Mastercard Debit Card. $73 using CC. to Darwin Flights for $39 using Mastercard Debit Card. $47 using CC. to Melbourne Flights for $59 using Mastercard Debit Card. $67 using CC. to Adelaide Flights for $69 using Mastercard Debit Card. $77 using CC. to Cairns Flights for $95 using Mastercard Debit Card. $103 using CC. to Brisbane Flights for $39 using Mastercard Debit Card. $47 using CC. to Sydney Flights for $35 using Mastercard Debit Card. $43 using CC. to Melbourne Flights for $55 using Mastercard Debit Card. $63 using CC. to Melbourne Flights for $39 using Mastercard Debit Card. $47 using CC. to Bali Flights for $99 using Mastercard Debit Card. $107 using CC. to Sydney Flights for $109 using Mastercard Debit Card. $117 using CC. to Melbourne Flights for $119 using Mastercard Debit Card. $127 using CC.